Full Circle Campaign Attribution is a plug-and-play native Salesforce® application that enables marketers to reveal the campaigns that are performing best and contributing most to revenue. With Full Circle Campaign Attribution, you get powerful attribution models out-of-the-box and the flexibility to customize for advanced multi-touch and multi-variable attribution, with features that help fine-tune your attribution model to fit your unique sales cycle and business needs. Full Circle Insights understands your need to segment and target, and you can do just that with comprehensive and granular reports right within Salesforce®. With Full Circle Campaign Attribution, gain the insight and confidence to optimize your marketing mix in order to drive more revenue and greater ROI. Your sales cycle and marketing goals are unique, and you require the flexibility to customize your attribution models. First-touch and last-touch models are useful but often under-credit many marketing touchpoints. To address this, our product provides you with out-of-the-box standard and multi-touch attribution models well-established in the industry, with additional support for custom-weighted touchpoints AND the custom campaign variables you’ve created in Salesforce®. Find the model that works for you by using our attribution insights features, such as side-by-side model cross-compare, campaign-to-revenue correlation, and details from our Full Circle Deal Explorer drill-down. With these on-the-fly tweaking tools, adopt the right attribution model for you based on best practices using criteria that are relevant to your business. Our comprehensive reports provide enhanced visibility for marketers to see exactly which campaigns impacted a deal and use these insights to make targeted marketing decisions. 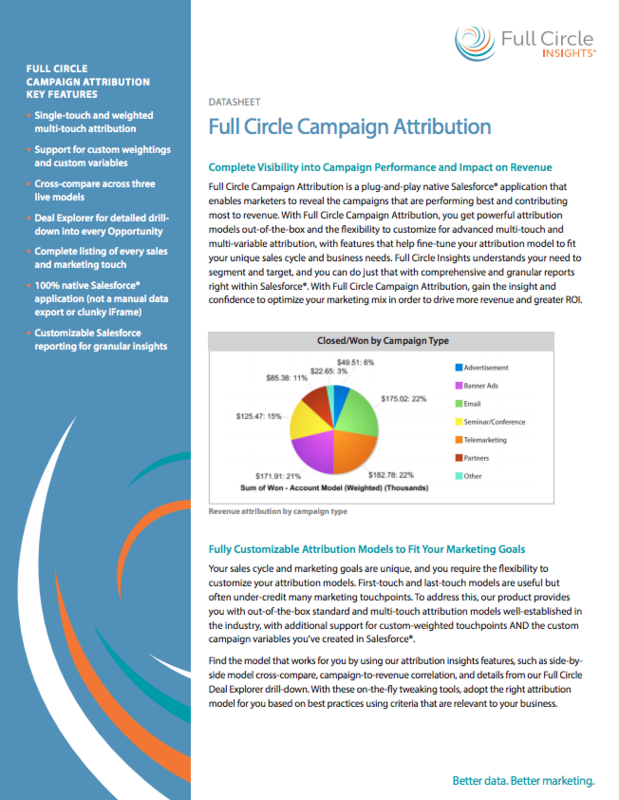 Whether you need to segment your campaigns by type and customer size, break-down your pipeline by lead source, or view campaign trends over time, Full Circle Campaign Attribution supports performance-driven marketers with intelligence on demand to make strategic marketing decisions and campaign mix allocations with confidence. How does marketing align with sales to determine marketing’s contribution to the opportunity cycle? For any deal, which campaign made the biggest impact? Full Circle Deal Explorer, which comes bundled with Full Circle Campaign Attribution, allows teams to answer these questions within Salesforce® by illustrating cumulative Lead and Contact interactions on every Opportunity. Marketers can drill down into individual Opportunities to view critical campaign influence metrics, across three side-by-side attribution models, and see the primary marketing touch points. Plus, with Deal Explorer, your team can visualize event and campaign history relative to Opportunity stages. We know you want to quantify your campaign performance to make decisions and get executive buy-in, and Full Circle Campaign Attribution allows marketing to report from the de facto system of record for sales reporting. Full Circle Insights enables you to track and report campaign performance at the “50,000 foot level” as well as drill down into underlying data sets for all relevant Salesforce® records right at your fingertips, without manual exports or clunky iFrames. As a native Salesforce® application, Full Circle Campaign Attribution is easy to administer and implement, so you can get up-and-running and make an immediate impact on revenue! Download the Campaign Attribution Datasheet below for more information on this product.